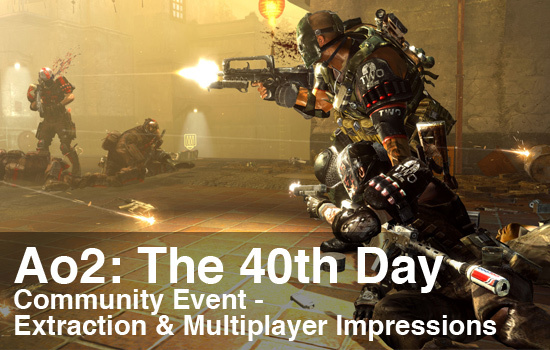 As they did last April, EA recently flew a few members of various gaming websites to Montreal to check out Army of Two: The 40th Day. This time around, though, the focus was on the three multiplayer modes and the new Extraction co-op mode. After spending an afternoon running, gunning, and ducking through the streets of Shanghai with just my co-op partner by my side, it became very clear that EA Montreal has not only improved on the original title, but they’ve created a shining example of why couch co-op can never be replaced. The original Army of Two offered three multiplayer modes in addition to the full co-op campaign: Warzone, where teams of four would need to complete randomly generated objectives in order to score points; Bounty, where players hunted down the leader of the opposing force to turn them in for money; and Extraction, where players would need to rescue VIPs and get them to the extraction point. The sequel keeps the Warzone multiplayer mode, but ditches the other two. In their place, EA Montreal has created a new Co-Op Deathmatch mode, where up to four teams of two players each face off to see who can rack up the most kills, and a king-of-the-hill type mode called Control. In addition to these, they added the “name’s the same, but the game’s changed” Extraction mode, the four-player co-op survival mode that had Jim all aflutter when it was announced back in October. Before delving into the nitty gritty details about each of these modes, there are a few general gameplay aspects that are present in all of these modes to talk about. First, all of the multiplayer modes have a splitscreen with on-line option so you’ll be able to play with your buddy on the couch next to you while you join up with, or face off, against other players on-line. For those of you out there with two systems and two TVs to play them on, there is, unfortunately, no system link option. If you go the splitscreen option, just know that multiplayer stats, campaign progress, and any custom masks you download are tied to the first player’s XBox LIVE/EA.com account. All of the multiplayer modes can be public or private games and also allow players to drop-in/drop-out at will, which means that should your partner drop in the middle of a Co-Op Deathmatch you’ll be without a partner until another player joins up or you invite someone in to help you out. Finally, each of the multiplayer modes have matchmaking lobbies where, depending on the mode, you can set each team’s size (multiples of two only), move players around on the teams, and get geared up for the match. Speaking of gearing up, players select a primary and alternate weapon from a set list of combinations that cover a few different play styles, such as a powerful sniper rifle paired with a silenced pistol, an AK-47 paired with an SMG, and a pump-action shotgun paired with a handgun. In all of the modes, Co-Op Deathmatch in particular, talking with your partner about who’s picking which gun combination is key to victory. After all, you don’t want to both be looking through a scope when the enemy sneaks up on you from behind. This does mean that the gun customization feature, as well as any additional guns you may unlock in the single-player mode, is absent in multiplayer; however, it only makes sense considering how ridiculous you can make some of those weapons. Another feature present in the single-player mode that’s missing from the multiplayer modes is the “co-op playbook,” although it wasn’t always that way and in my interview with lead multiplayer designer Eric Chartrand (which will go up tomorrow) we talk a bit about how and why that decision was made. Two features from single-player did make it through to the multiplayer modes, fortunately. The first is the ability to revive your partner if he’s downed, which is particularly crucial in the Co-Op Deathmatch as partnership isn’t truly down until both players are down. The second is the ability to use the GPS system, a HUD that highlights foes similar to Halo 3: ODST’s VISR system only sans the light amplification. In addition to being the source of your good health and revival, your partner is also the source of ammo and grenade refills. As you’re only given one grenade at the start of a match, and bullets tend to get used up rather quickly, sticking with your partner in these modes helps ensure prolonged survival.